I remember as a kid going every year to the pantomime, a British institution combining elements of fairy tale, theatre and music hall. There is always a villain. As he sneaks up on the hero, kids in the audience scream in unison: "behind you, BEHIND YOU". With its recent releases, the villains have missed Apple sneaking up behind them. Forget the iPod and the iTunes shop. Forget the iPhone. Apple is still in the business of making well-designed computers and software to run on them. A few days after the Bangkok Press Briefing, an iMac was delivered to me at Mahidol University's Faculty of Engineering. I was teaching Computer Engineering students at the time. They have seen me using the MacBookPro over the last few weeks so have seen Macs in class before, but from their expressions when I unboxed it, it was clear they thought that Apple has a winner. With the brief hands-on experience I allowed, they were sold. When they asked the price for this 20", 2.4GHz model (58990 baht including VAT), for the first time there were not mumbles of "expensive". I saw sage nodding, with expressions of "not bad". I have always liked these flat-panel iMacs. The first ones (after the G3 and the anglepoise models) were of white polycarbonate. This third update sees Apple move from white, which so many other manufacturers are copying anyway, to aluminium and glass. The screen is wide aspect. The black surround conceals an inbuilt iSight camera (a green light shows when it operates). The microphone is on top of the frame, but is almost invisible as the laser-cut holes are so tiny. The enclosure is thinner and this brought admiration from the students when they realised the processor, hard disk and everything else was there. This particular model comes standard with a 320G hard disk which can be upgraded to a 500GB or 750GB Serial ATA 7200-rpm hard drive. The 2.0GHz version which comes with the 250G disk has 320G and 500G options. 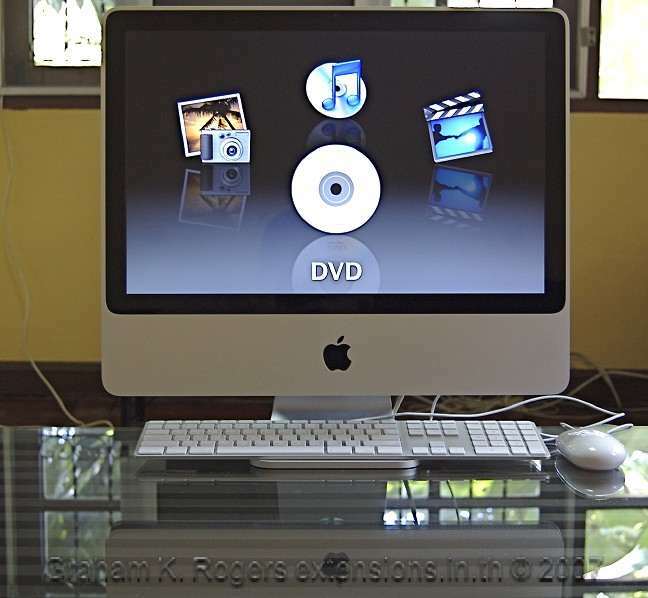 The other iMac version has a 24" screen and comes with the same 320G hard disk, but with options for 500GB, 750GB or 1TB Serial ATA 7200-rpm hard drives. The 24" also has the option of a 2.8GHz processor which I have seen offered for 89,900 baht (with VAT) in the new Central Pinklao iStudio store. These iMacs come with 1G of RAM as standard which can be upgraded to 4G. They are equipped with Wifi to the 802.11n standard as well as Gigabit Ethernet and Bluetooth. 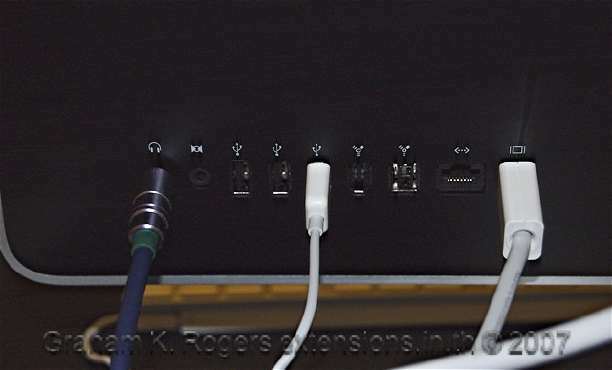 Connectors are at the rear of the display and include three USB ports, Firewire 400 and 800, as well as a video-out connector. The keyboard has two additional USB ports. Hard disk size provides plenty of room for those who want to take advantage of the ability to run alternative operating systems on their Macs. For example, Walt Mossberg wrote recently in All Things Digital that he had installed Vista on an iMac and that with the high scores his testing produced, it was "very impressive for a computer that wasn't designed with Vista in mind." I run Macs because I am quite happy with OS X and the other software that comes as part of any new installation. 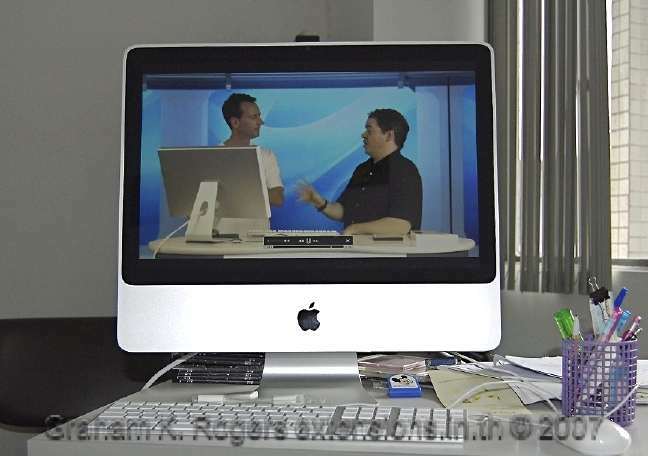 The iMac had the latest version (10.4.10) of Tiger and, like all new Macs, a full copy of iLife '08: ready to make photo books, calendars, movies and podcasts out of the box. In the first couple of days I tried it in a number of locations in the Faculty of Engineering with both wifi and Ethernet networking. Even with the university's occasionally cranky proxy settings, it was online instantly. I took it home for the weekend. As I am still running an Ethernet network there I linked the iMac to that, then set it up as a wifi router. Other computers can connect to the Internet via the Airport connection. In my concrete house, the signal was such that, with the iMac on the ground floor, I was able to work upstairs with no ill effects. The Airport indicator still displayed all four bars. It only dropped to three bars when I walked the notebook computer some 30 metres down the road. Working in the garden was fine. With iTunes sharing on, I was also able to access music and podcasts installed on my MacBookPro from the iMac: its speakers are quite a bit better. 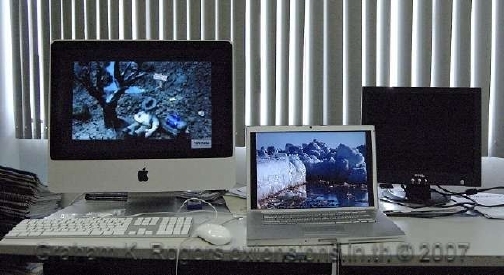 They are at the bottom of the iMac, angled down to reflect sound from the surface the computer sits on. Part of the design of the iMac is a single aluminium foot. 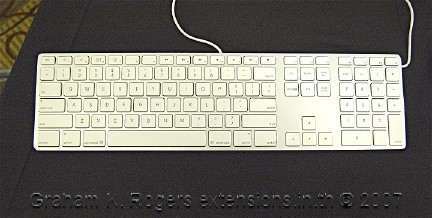 It is shaped in such a way that (as before) when not in use, the new ultra-slim keyboard can be slid beneath the computer to save space. Next: A few days hands on experience of the iMac. Note: a full report plus more images from the Press Briefing is also online.